Did you know that a shirt, which is today a primary piece of clothing in a man's wardrobe, used to be an undergarment before 1700s? By 1700s the shirt came into existence, and embroidered and embellished collars became a fashion. And the shirt you wear today with breast pockets and proper collar came into existence by 1950s. Whether you wear ready-made shirts or get them tailored to your measurement, here are a few basic things to know about a men's formal dress shirt. 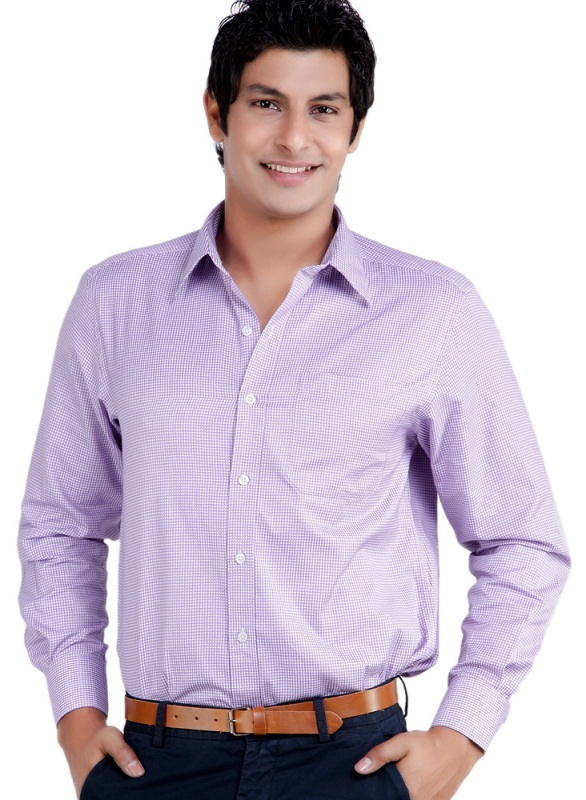 A men's formal shirt or the dress shirt is a button up shirt, with crisp collars, long sleeves and proper wrist-cuffs. The ready made formal shirts these days come with a single breast pocket on the left. The half-sleeves shirts which some men so proudly wear to formal occasions were considered formal in the 1950's, but not now. Many brands still manufacture short-sleeves formal shirts, but these sleeves are shorter than the tailor-made half-sleeves which land up to the elbows and become quite a fashion eye-sore. It is acceptable to wear half sleeves formal shirts but please DON'T wear a tie with a half sleeves shirt unless a tie is a part of your office dress code. It looks very odd. When it comes to the word 'formal', many men even today cannot think beyond a white, an off-white or a blue shirt. There is a reason how and why these colors came to be accepted as formal colors, but the reason exists no more. Centuries ago, white shirts signified high class gentlemen, who did not have to do any labor work, hence the phrase 'white collared jobs'. 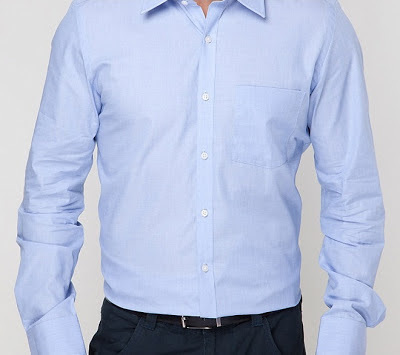 Blue color became popular in the US as it suited the complexion of most men and men's clothing companies started manufacturing more shirts in this color to get more sales. But In the last 10 years, I have seen men's clothing brands come up with a lovely variety of colors to introduce in your wardrobe and at times it even leaves me feeling so jealous, because you do not get as many color variations in women's formal shirts. Wearing a light pink formal shirt or a white shirt with pink stripes does not make you any less man. In fact, men who dare to wear colored formal dress shirts ooze confidence and charisma. They stand out from the rest of the crowd and get immediate attention. Nobody is telling you to wear loud, bright garish reds or oranges. But then there is a still a multitude of colors to choose from. If you are not confident wearing dark colors, try out pastels and light colors like lavender, pistachio green, grapes green, light lemon, light maroon, variations of brown, beige, light pink, brighter light blues, peaches etc. You can check out online stores like Jabong.com, Yebhi.com etc and see the choices of colors available to you in formal shirts. Men who stick to those safe blues, whites and grays are rather considered boring by women. 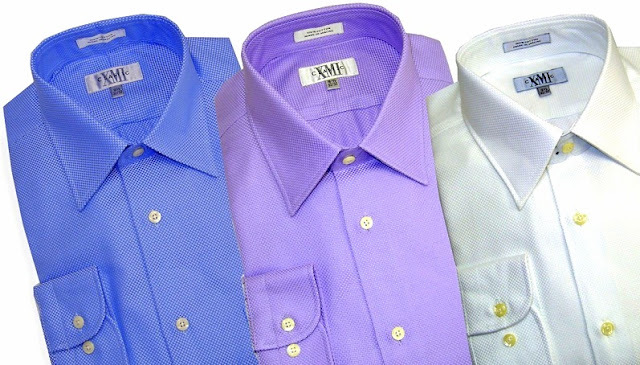 When choosing a colored formal shirt, it is also a good idea to select colors that suit your skin tone. If you need more information with that, let me know. 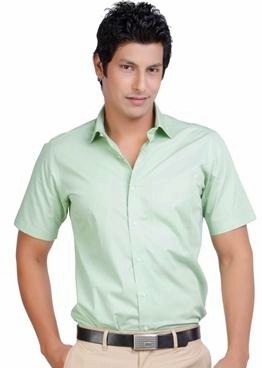 A men's formal shirt is usually made from a cotton fabric but now there are many varieties of fabrics in the market like jut cotton, polyester, linen, lycra and other blended fibers. You can choose the fabric based on your comfort level, the environment you work in (AC or Non-AC) and the climate conditions of your city. People who stay in humid climates prefer synthetic or blended fiber fabrics like polyester over pure cotton, as the sweat does not dry easily in pure cotton clothing. Similarly, men who stay in hotter regions can choose cotton or Lycra, while men in colder regions can choose linen. Silk can be chosen for more formal functions like weddings and special occasions. 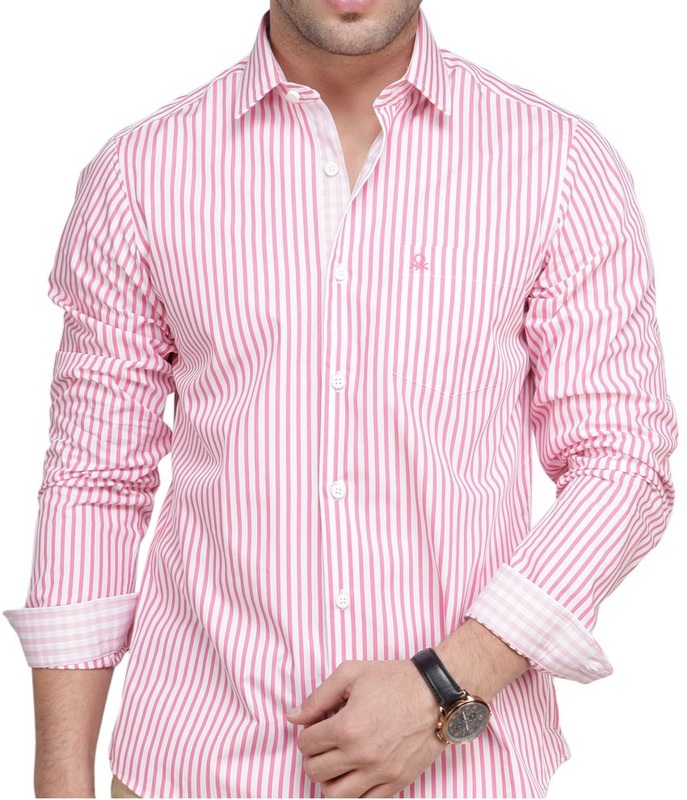 Formal shirts are mainly Solid, Striped or Checkered. Solid means a single colored Shirt. With changing times, and men's increasing awareness towards fashion and an urge to look good and attractive has made men's clothing brands to introduce a variety of patterns within these three main choices. The 'Solid' formal shirts can have many self-colored patterns woven into the fabric. Since the main purpose of a formal dress shirt is a no-nonsense, stick to the business look, the patterns are kept simple and non-obtrusive, so that it does not become too much to catch an onlooker's attention and take them away from the business. 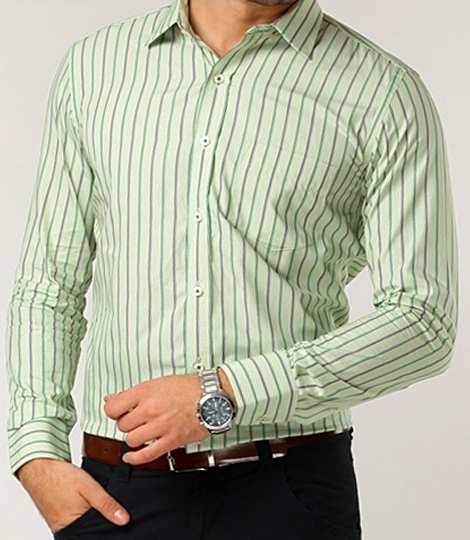 A formal dress shirt can have regular stripes, broad stripes or pin stripes (very thin stripes). To add a further variation, there can be multicolored stripes. 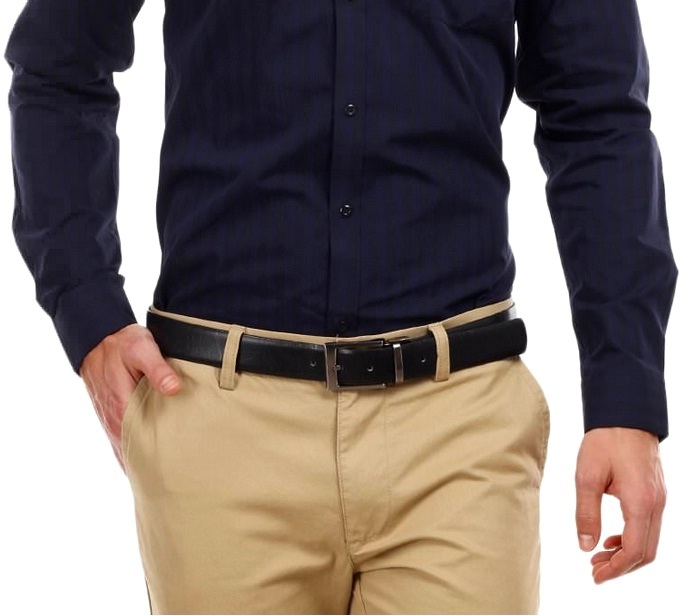 A formal shirt will have at the max 2-3 colors in case of multicolored stripes, else, if the colors become too attention drawing, it will become a casual shirt. 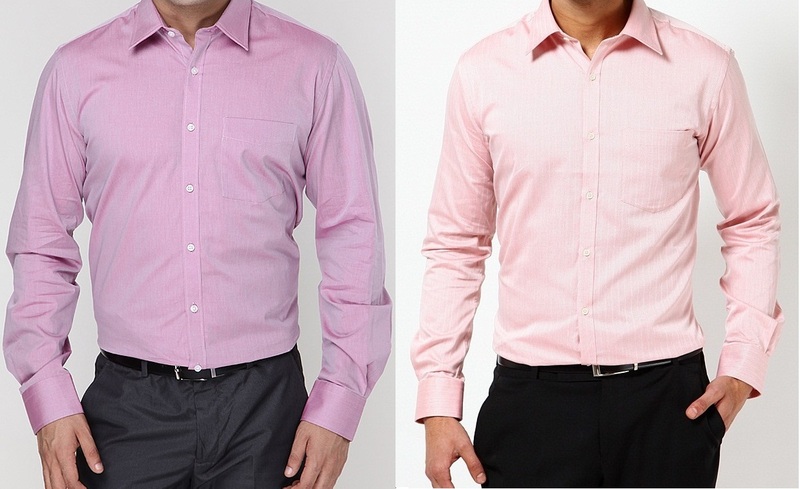 You can see an example of a pin-striped shirt in the second picture above (the pink shirt). How lovely this shirt looks! Finally checkered formal shirts can have large, regular, small or very small (micro checks) checks. The borders of the check pattern can be thin, regular and bold lines. So you see how it is possible to create a good variety of patterns, while staying between the limitation of solid, stripes and checks. 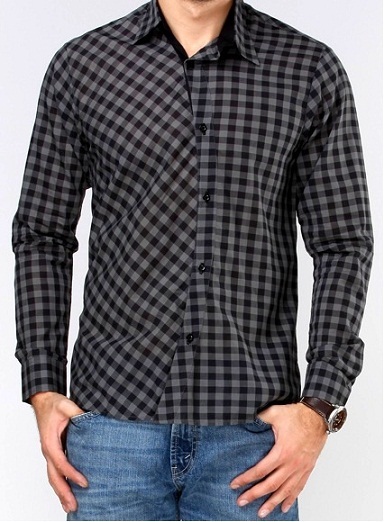 Then there are plaids, which look like checks but there is a difference. Checks are formed by a crossing of two solid colors where as plaid are square blocks formed of more than two colors. 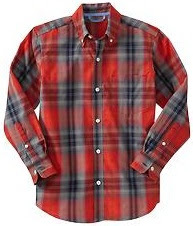 Moreover, plaid shirts are NOT counted formal, they are a part of casual clothing. WHAT IS A CASUAL SHIRT THEN? A casual men's shirt is something that deviates from the definition and patterns discussed above. A casual shirt can be short sleeved, can have any variety of patters, prints and colors depending on how sporty you want to look. It is a chilled out, relaxed, less-serious form of clothing. By less serious, I simply mean reserved for non-business, informal or a day to day dressing style. However, it does require some fashion sense even to sport casual clothing to accentuate your personality and not end up over-doing anything just to look Mr Cool. This is a full sleeves collared shirt with cuffs and check pattern. What makes it casual then? See the variation in the pattern on the left and the right sides of the shirt, which makes it attention grabbing. Moreover, a formal shirt is ALWAYS worn tucked-in. What makes this shirt casual? The two pockets, the attention-grabbing flaps on the pockets and the stylish stitch at sleeves give this shirt a sporty casual look. Is this shirt formal or casual? This is a formal Benetton shirt but the wearer has spoilt the formal look by folding the cuffs and keeping the shirt out. You would do this only in very informal situations when you are among friends at home or in a casual gathering after office, but never in a formal environment. The purpose of a shirt's collar is to define and draw attention to a man's face. Most ready-made men's formal shirts come with a traditional color, with the an average height of the collar and a medium spread space between the collar's points.However, different men will have different face shapes and a different neck size. So a perfectly fitting shirt may actually not be doing full justice to your personality. I will shortly do another post on shirt collars and how to choose the one to suit your face. Stay tuned. 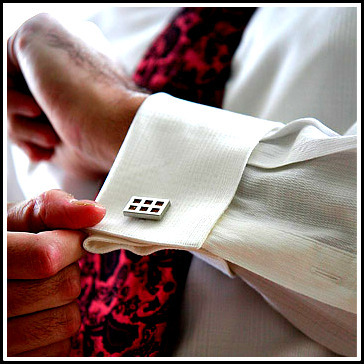 The cuffs of a men's formal shirt can be either single layer button-up cuffs or the folded ones, also known as the French cuffs. The button cuffs can be on both formal and casual shirts, however, the French cuffs are specifically formal and require a pair of cufflinks. There are further variations to both button and french cuffs, which we will see in detail later. Ready-made shirts are manufactured with the objective of 'One fits All'. However, everyone has different arm lengths and different body measurements. So a dress shirt that may fit you at the neck, may have longer sleeves; or a shirt that may fit you perfect at the chest may be too loose around the waist. So you almost always compromise on some part of a perfect fitting formal shirt. 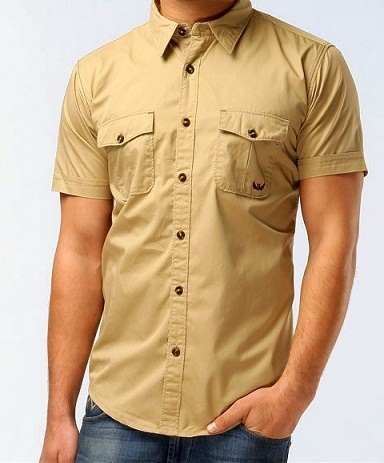 For example, see this model in a slim fit shirt. The shirt fits him perfectly but the arms are just too long. As long as it doesn't look attention catching or very odd, it is okay! While many men's clothing brands now offer you 'regular fit' as well as 'slim fit' shirts, there are still people like my brother, who do not fit into either of them perfectly. This is where tailored-shirts or made-to-measure shirts come to your rescue. In India, it is very common to get your formal shirts tailored, but it may be an expensive affair in some countries. 1. First and foremost point is comfort. Choose a comfortable fabric, while keeping in mind, the occasion you will be using that shirt for. Is it going to be a daily office wear or for a party or wedding function? 2. The band of your shirt's collar should not be too tight around your neck. So on buttoning the shirt up to the topmost button, you should be able to slide at least your first two fingers in the space between the collar and your neck. When giving measurement to a tailor, make sure to add this two finger space. 3. Make sure that the point of the shirt where the arms are attached, fit perfectly on the edges of your shoulders. These shoulder points should neither be closer towards your collar nor should they fall down beyond the shoulder edge. 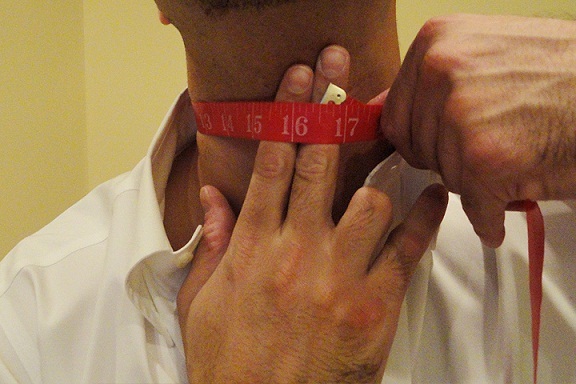 Many men on gaining weight try a bigger size shirt, when the circumference around the chest, the waist and the neck may have increased but the shoulder width may still be the same. In that case, a bigger size shirt would fit them at the neck, the chest and the tummy, but the shoulder points may be falling down. 4. The wrist-cuff of your formal shirt should not be so loose that you can slip your fist in and out of it easily, or that it lands up to half of the back of your palms when when you hang your arms. The cuffs should be comfortably loose, but tight enough for you to unbutton them, if you want to pull your sleeves up or take your shirt off. 5. When trying a ready-made formal shirt or any full sleeves shirt, button the wrist-cuffs and raise your arms up. You should be able to lift your arms up comfortably, without your sleeves slipping halfway down to your forearms. Similarly, when you hang your arms down, the extra fabric that gathers near the cuff should not be more than 1 inch. A good tailor would keep those extra inches in account so you can move your arms around comfortably in your made-to-measure shirt. 6. The shirt should not hug you too tight at the waist or at the chest. You should be able to breathe without blowing the shirt like a balloon along with your breathing. There should be enough space inside to put in another layer of clothing comfortably. Meaning if you want to slip in a tee-shirt or body warmer inside on a cold day, there should be that much extra space inside your shirt around the chest and waist. So it is a good idea to try a formal shirt over a t-shirt, when you go shopping. 7. Finally, when everything fits, check if all the stitches are in place and all buttons are intact and properly stitched. Based on feedback from friends and male followers of my blog, this is the first men's inclusive article and I hope you like it. Please share your views and feedback in the comments below. ** images collected from jabong.com, yebhi.com and other men's custom stitching websites for illustration purpose only. Images not owned by me. Thank you Gagan for sharing. I agree it should not be so tight that the buttons should come off.